What is the best cable workout? Using cables provides a much different feel than free weights and can be favorable or unfavorable at the same time. Find the best cable workouts here and see how they can work for you! TOPIC: What Is The Best Cable Workout? Using cables provides a much different feel than free weights. Cables can be beneficial and unfavorable at the same time. What is the best workout using only cables? Be specific. Include exercises, sets, reps, etc. What are some of the positive and negative aspects to using cables? Bonus Question: What is your favorite cable exercise? Why? A wide range of people are already using or thinking about incorporating cable machines in their workout routines. This may be because some use them for their convenience or if there are few alternative resistance devices available. Others may want to use cable machines simply to change the type of stimulus they are putting their muscles through - a good way to prevent adaptation. Still yet, there may also be some who have heard of certain unique benefits of cable exercises over other forms of exercise. These exceptional aspects of cable exercises are investigated and explained later on. Regardless of the reason that cables are being used in workouts, it's important to understand how to get the most out of them. First, we'll look at how to construct a good program that uses only cable exercises. The first part of any workout program design process is to outline the goals that we have. Then, with these goals in mind, we can set up a plan to accomplish them. Finally, we can try out the routine and meet our goals after proper execution. Provide the best stimulus to widest range of muscles using a cable machine's capabilities. This efficient use of cables will yield the best muscle size and strength increases. While cable machines can be used in both compound and isolation movements, many compound movements can be inconvenient, awkward, equipment dependent or even less effective when done using cables. More details on the downsides to cable exercises can be found later. For now, let's assume sticking with a majority of isolation types of exercises will produce the most efficient use of gym equipment in stimulating growth. A full-body workout is definitely possible through strict cable usage only. However, additional equipment, like ankle cuff straps, might be needed to work lower body muscles. With this in mind, our workouts will be designed primarily to target upper body growth using equipment available at most every gym. If additional lower body work is desired, they are best incorporated using free weights or machines and can be scheduled on any of the days labeled "off" in the following layout. With cables, many different ranges of motion are possible for the same muscle, and the routine will take advantage of that. Warm-up before each workout by doing at least two sets of an exercise for each muscle group worked that day for 15-20 reps of 50% maximum weight. Keep workouts to approximately 45 minutes or less in length. If the duration goes over that, the risk of the body producing more undesirable, catabolic hormones like cortisol increases. Rest 60-90 seconds between each set to keep intensity high. This will also keep blood flowing to the target muscles and make bigger pumps possible. Use 8-12 reps per set to help maintain strict form and control while still using heavy weights. Adopt proper post-workout recovery techniques. Stretching, protein and carbohydrate shakes, and contrast baths are some possibilities. Make sure to use good practices in the areas of sleep, nutrition, and stress management. These together with the workout are what produce results. For those that have the means, supplements like creatine, nitric oxide, multivitamins and proteins can also enhance workout results to a higher level. Now that we have designed and now know that an all-cable workout program is possible, it might be useful to better understand the capabilities of using strictly cables. Like any other form of exercise, cable work has both advantages and disadvantages. Exercises using a cable puts muscles under a constant tension. With free weights, the angle of joints are often changing, thus the resistance on the muscle is also changing. Under constant tension, blood flow is often increased, thereby resulting in quicker and bigger pumps. The end result is the promotion of larger capillary beds to be rebuilt within the target muscle. Safety is always a concern during any exercise. Fortunately, cable machines make it especially difficult for one to get in a position to hurt themselves. The weight is always controlled and secured on the stack, unlike free weights. Here, loss of control can result in injuries. The range of motions with cable exercises can often be performed more smoothly and naturally. This leads to greater degrees of comfort during workouts. By minimizing ballistic impacts, a cable will put less stress on joints than free weights. Because free weights require balance, it's harder to use them to target specific muscle areas and angles. Cables can help bring out those separations in muscles due to the precision of muscle contraction that is possible with specific angles. This ultimately helps create a more chiseled looking physique. There is no need to rely on a spotter during cable exercises. Usually spotters or training partners are advisable when working with heavy free weights to reduce risk of injury. Without the need to wait for a training partner or spotter to be available, cable workouts might get done quicker and with less wasted time. The temptation to spend time chatting would also be greatly reduced. Elimination of the need to rack and re-rack weights. With free weights, this process can be tedious. Using cables instead saves both the time and the effort. Free weights can often be intimidating to those new to strength training equipment. Cables are easier to get started with, making them a good option for this group. Supporting muscles are not drawn upon to the same degree that would be necessary with free weights. This means less total recruitment of muscle fibers and potentially less muscle gain. -Some exercises are very difficult to mimic with cables. These are mostly the compound ones. Take squats for example. They happen to be one of the best mass builders, but are virtually impossible to do properly without free weights. Additional equipment, like ankle cuff straps, are not always found in all gyms. This equipment may be required for full body workouts and certain exercises with cable machines. Some might consider some of the disadvantages as relatively major. However, these negative aspects can be overcome, while many of the advantages are exclusive to cable exercises alone. Hopefully this encourages the incorporation of cable movements, at some point, in everyone's workout routine. What is your favorite cable exercise? Why? Some people may find that they have difficulty in training their back to its fullest potential. Many back exercises, when executed without lifting straps and without strict form, transfer some of the weight, unnecessarily, to the forearms and biceps. A cable exercise that I've started using recently happens to eliminate most of this problem. They're called straight-arm pull-downs, and the exercise primarily targets the latissimus dorsi. It could actually be classified as a compound movement as the rear deltoids and lower trapezius are recruited for assistance, with the abdominals, obliques, gluteal muscles and erector spinae being used to maintain balance and proper form. I've started using this cable exercise, and I'm satisfied with the effort required to coordinate and execute the movement successfully. I know that I'm working hard when I feel my stomach do a flip. This exercise not only improves back strength by directly targeting and singling out the back muscles, but also improves core strength because of the balance needed to maintain correct form. Anyone having trouble with developing their back might benefit from this often-overlooked movement. We've now seen everything from personal favorites to whole workouts designed around using cables. With the unique benefits of cable movements better understood now, there's no reason to leave them out of workouts. Hopefully, with hard work and dedication, the incorporation of cable exercises can help bring you closer to your fitness goals. We often face the question: "Which one to choose? ... Free Weights, Machines or Cables?" Every bodybuilder no matter if he is advanced or novice has incorporated at least one exercise of the three types in his/her training regiment. Using a variety of training exercises has numerous benefits for the growing individual. Free weights - Work great for mass (Heavy Compound Movements). Machines - Free weights alternatives, provide more safety and isolation, but less stress on the muscle. Cables - Superb Isolation, work great for details. Cables have become more and more popular in recent years due to the fact that they work efficiently for both beginners and advanced bodybuilders. Cables offer a unique isolation and thus are the best option for a finishing exercise. Cable exercises also provide very good stretch and good pump. The best time to incorporate cable exercise is near the end of the training when strives to maximize the pump and simultaneously stretch the muscle so that the muscle fascia is loosened and muscle growth can occur easily. Most of the advanced and professional bodybuilders have reported that the long regular usage of cables in their routines has added sufficient amount of details to their muscles. Cables are also very beneficial to the novice bodybuilders and those who come into the gym for the first time because cable exercises are easy to perform and easier to control. If you are tired of the regular boring training sessions or if you are stuck in a plateau a workout plan composed entirely of cable exercises can provide new feeling and stress to the muscles. As a result of this training program your muscle will look more detailed and more complete. Training Split is Day On, Day Off. This is so because you will repeat the cycle immediately after completion and on average you will have four training days per week which is perfect for recuperation. The rest period between sets is reduced to 1 minute at most exercises because - this way you will get a better pump during training and the whole training session will be very intense. Always stretch before training for 5 minutes. Do all kinds of stretches. For more information about stretching visit: Stretching Exercises! by Cynthia Oosting. Safety Belt is NOT required, but it will be a good idea to use one. Cable exercises are not dangerous for the lower back like the free weight so don't worry. Cardio Activity is optional. Do cardio only if you are on a diet or training to shred body fat. Use strict form while performing the exercises and focus on contracting the muscle forcefully and then slowly stretch. Perform the cable training for full body for one month at most and then switch back to normal training sessions. Increase the number of repetitions in each exercise to at least 12 reps.
Rest for at least 1 1/2 minutes. Take more rest days if needed. Add drop sets, pre exhaustion, pyramids, and forced reps.
Cables provide great isolation and thus more focus on the desired muscle group. Cables provide more safety while performing exercises compared to free weight. Less stress is put on the joints and more on the targeted muscle groups. Regularly performing cable exercises fully develops the symmetry and the muscle fiber recruitment of the desired muscle group. Cable exercises are ideal for stretching. Cables put stress on the muscle through the whole range of motion. Great for details and separation. Exercises involving cables are ideal for beginners because they offer a smooth and slow motion. Exercises like the Crossover, Triceps Push-down and Cable Curl are a MUST DO in every training routine because they have proven to be very effective. Significant muscle mass is impossible to achieve with only using cable. Cables work more for details and separation and less for mass. Most of the cable machines provide weights up to 225 pounds, which is not enough for significant muscle stress on the larger muscle groups. Strength can be increased little with only using cables. There are some gyms (mostly powerlifting oriented) that do not have cable machines. Muscles get used to cables very easily. It is imperative not to perform the same exercises each and every time. Eat at least 2 gr of protein per kilogram of bodyweight. Consume a lot of vegetables and fruits. My favorite cable exercise is the Cable Crossover. I do it at almost every workout because it is the best finishing exercise for the chest. It also produces good details. Cable Crossover allows for very strict reps and it also gives me superb pump. I always do 3 sets of 12, 10, 8 and then probably a drop set. I feel that this exercise stretches my pecs well and it also allows for maximum fiber recruitment. I often incorporate the "X-Rep Principle" using the Cable Crossover because this is one of the few exercises that allow both superb stretch and superb control. Last, but not least is the fact that the Cable Crossover has proven to be the exercise with one of the strongest stress parameters evaluated by a special Electro-Magnetic machine that estimates the impact on each exercise on the muscle fibers. Cable training has become more popular over the years, and many people have been taking advantage of using cables. However, don't be fooled by the Bowflex advertisements that state you will get the body you want in six weeks or less guaranteed, because it's not true. Those people you see in the ads have been training for years with both free weights and cables. Don't get me wrong though, Bowflex machines are good, but use them wisely. When training with cables, your muscles become fully shaped and they look complete. It's possible to gain muscle size when using cables, but it's highly unlikely that you will look like a bodybuilder. With all that said, use cable training once you have obtained adequate muscle mass. Beginners in the sport of bodybuilding have trouble learning the basic exercises, and using free weights can increase their chance of injury. There's two alternatives to free weights, use machines, but expect a limited range of motion, or use cables and expect an unbelievable pump and a full range of motion. If you chose cables, then read on for the best cable workout. Always stretch for 5-to-10 minutes at the beginning and end of your workout. Stretching increases your flexibility and allows you to train harder and more safely. Here are some good stretches. For a full stretching guide, visit the stretching database. Advanced bodybuilders are usually massive individuals who try to perfect each muscle, because sheer mass alone won't win them a competition. Cable training is usually included in pre-contest preparations to help them attain aesthetic physiques. Eating the right foods is just as vital as lifting weights. Whether you're trying to lose weight or add 20 pounds of muscle, your diet determines your progress. Eat 4-to-5 meals daily, to keep your metabolism running high. Stick to basic foods like red meat, chicken breasts, fish, eggs, potatoes, rice, fruits and vegetables. Drink plenty of water and supplement with protein shakes, a multivitamin, and a fat loss/energy product. ZMA and joint supplementations can also be taken. Muscle grows when you rest, which is why you should have rest days and sleep at least eight hours on daily basis. While you sleep, your body produces growth hormone, which helps you recover from your workouts. When using cables, it's easy to perform most of the exercises, and good form provides good results. Good form also decreases the risk of injury, which can be detrimental especially if it occurs before a contest. Cables provide a long range of motion, so more muscle fibers are involved. A long range of motion is one of the factors that determine the pump you will experience when exercising. Last but not least, you can work a muscle from a variety of angles and really isolate it, which is why cables are excellent to use when trying to fully shape a particular muscle. Cables can be expensive, especially if you plan on buying a Bowflex or a similar machine. Once you reach the maximum weight on these machines, you have to upgrade them and buy more resistance bands etc. and that can be costly. Cables also tend to break more easily than free weights. Unlike free weights, cables don't involve stabilizing muscles. Strength and muscle size can be slightly increased, whereas with free weights, strength and muscle size skyrocket in a few short weeks. 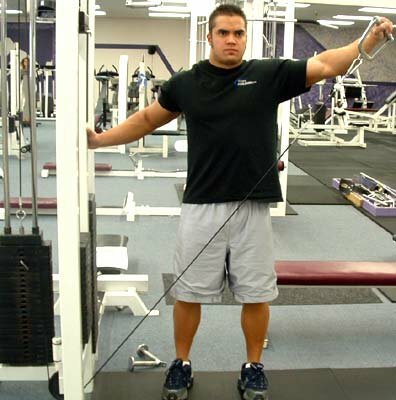 My favorite cable exercise is Standing Low-Pulley Deltoid Raise. This is a great exercise that isolates the side deltoids. I like this exercise because it's easy to do and it produces results. I keep my rep ranges between 12-and-15 to get a good pump. Drop sets can be used with this exercise for additional side deltoid growth. I hope this article has helped you understand the importance of cables and how to efficiently use them. Good luck! Using cables provides a much different feel than free weights. Cables can be beneficial and unfavorable at the same time. Just like any other form of weight training, using cables have their benefits and negatives. In this article I will discuss when and how it is best to utilize the cable apparatus, as well as providing a sample workout. Please read on. *** Squats and step-ups require stirrups. Additionally, you can only perform them on a machine where the cable stacks are close to each other. Otherwise, there aren't a lot of other options for quads other than abductions. Standing and lying leg curls require cable straps. Standing calf raises require a waist strap. *** 45-degree lateral raises are just side-lateral raises bent over at a 45-degree angle. Doing them this way increases the tension on the mid-lower delts and minimizes back involvement. *** Incline and decline cable chest press are performed on the same apparatus as flat cable chest press. To perform them on an incline, simply raise your arms higher toward your nose-hair level, and to perform decline, press the weight to your lower-mid chest. This is a 4-day split using just cables. I recommend alternating this workout every other week with a free-weight and machine routine that also trains your whole body. This will ensure you are getting the best of both worlds. Each exercise should be performed using 2 sets of 8-12 repetitions. Rest periods should be as short as you can without sacrificing the intensity of the following set. Firstly it's important to note that the cable machine is not just another machine. The cable apparatus has its own differences and should be viewed as a separate apparatus. It has it's similarities to free weight and machines. Firstly, like free weights it doesn't force your body into a fixed position during the movement. As a result of this, it allows for greater range of motion, especially for those of us who are bigger limbed, meaning you will get more out of each exercise. Cables also provide more tension on the muscle, especially during the negative phase of a movement. The negative part of a movement is important for hypertrophy, and cables encourage us to get the most of it. As a result of the constant tension on muscles during the movement, it is a good choice for isolating muscle. From my own experience I have found that cables makes my muscles appear harder and more athletic opposed to that rugged look that is associated with free weight. This is mainly because free weights encourage you to use more than just the target muscle. Everyone is aiming for a different physique, and the ratio of free weight to machine exercises you choose should be based on what type of physique you're aiming to achieve. As a result of the above factors, cables exercises will enable you to isolate muscles more, and sculpt in some separation, whereas free weights and machines are better options for bulking. From my own experience, I wouldn't neglect cable work from your routine in a belief that it won't add size because being a bodybuilder, size isn't all you should be aiming for. If you balance free weights, cables and machines in your workouts as well as balancing compounds and isolation exercise, you will developed a winning physique, even in the off-season. I love these, either on dumbbell or free-weights. You will be surprised how similar they are when performed on cables, but with the added benefit of being a lot more smooth in motion. To perform these, stand against a cable stack, grabbing the bottom single-cable pulley and holding at your side. Although it isn't pictured, lean slightly to the left, which forces more tension onto the front deltoid. With the pulley at your side, bring it forward and up with arm straight, but not locked until it reaches eye level in front of you. Pause and hold for one second, and slowly lower the weight back to starting position. Aim for 8-12 reps. 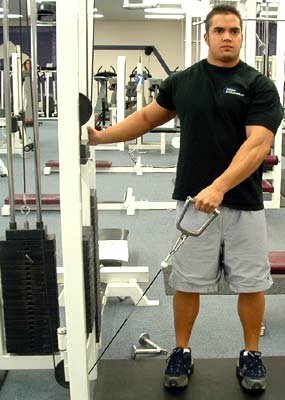 The cable machine is awesome for training delts like the above the exercise. Most of the free weight delt exercises can be manipulated onto cables, such as front raises, cable side-laterals, bent-over laterals, upright rows and even arc presses. They won't give you a massive, rugged look, but will they will complement the use of free weights and give your delts the separation that will be harder to get using just dumbbells and barbells. This can happen to any muscle if you use cables. Overall, I recommend using 1 cable exercise per muscle during the off-season, and 2 during pre-competition, and you will get the balanced physique you are aiming for.